Higher education institutions benefit from various evaluation systems for the purpose of raising their teaching qualities. The sufficiency of academic service is investigated and arrangements for improving teaching quality are made using these systems. 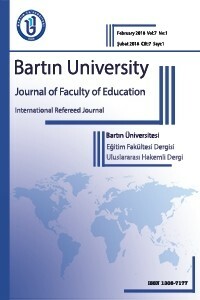 In this study, an approach is proposed to investigate and report student perception-based evaluations together with academic knowledgeactivities of instructors for teaching quality in Bartın University. This approach has three phases: i) Constituting teaching quality database, ii) Clustering study for this database, iii) Reporting the results using MySQL-based server. In the first phase, database is constituted from evaluations of instructors and their students in Bartın University. In the second, this database is classified using k-means algorithm and Silhouette index. Therewith, the database is separated into three clusters. Population means of these clusters are significantly different. By discriminant analysis, the clustering has 100.0% validity-rate. In the last phase, clustering results are reported through MySQL database management system. Yükseköğretim kurumları mevcut öğretim kalitelerini yükseltecek hedefleri belirlemede çeşitli değerlendirme sistemlerinden yararlanmaktadır. Bu sistemlerle, akademik hizmetlerin yeterliliği araştırılmakta ve öğretim kalitesini artırıcı düzenlemeler yapılmaktadır. Bu çalışmada, Bartın Üniversitesi öğretim kalitesi için öğrenci algısına ve öğretim üyesi akademik deneyim-faaliyetlerine dayalı değerlendirmelerin birlikte incelendiği ve raporlandığı bir yaklaşım önerilmektedir. Önerilen yaklaşım üç aşamadan oluşmaktadır: i) Öğretim kalitesi veritabanını oluşturma, ii) Bu veritabanı ile kümeleme çalışması, iii) Sonuçların MySQL-tabanlı sunucu ile raporlanması. İlk aşamada, Bartın Üniversitesi öğretim üyeleri ve öğrencilerinden elde edilen değerlendirmeler ile veritabanı oluşturulmaktadır. İkincide ise, bu veritabanı k-ortalama algoritması ve Silhouette indeksi kullanılarak sınıflandırılmaktadır. Buna göre, öğretim kalitesi veritabanı üç kümeye ayrılmaktadır. Bu kümelere ilişkin kitle ortalamaları istatistiksel olarak farklıdır. Diskriminant analizine göre, bu kümelenme %100,0 geçerlilik-oranına sahiptir. Son aşamada, kümeleme sonuçları MySQL veritabanı yönetim sistemi ile raporlanmaktadır. Albayrak, A.S. (2006). Uygulamalı çok değişkenli istatistik teknikleri. Ankara: Asil Yayın Dağıtım. Baş, T. (2005). Anket nasıl hazırlanır, uygulanır, değerlendirilir?. 3. Baskı, Ankara: Seçkin Yayıncılık. Başkır, M.B., Yıldırım, G. and Yıldırım, F. (2015). Improving evaluation system of program educational objectives and outcomes based on mudek criteria using fuzzy approach. The 4th International Fuzzy Systems Symposium (FUZZYSS'15) Proceedings. Yıldız Teknik University, 5-6 November 2015, İstanbul. p. 362-368. Chatterjee, D., Mukherjee, B. (2010). Study of fuzzy-ahp model to search the criterion in the evaluation of the best technical institutions: a case study. International Journal of Engineering Science and Technology. 2(7), 2499-2510. D’Apollonia, S. and Abrami, P.C. (1997). Navgating student ratings of instruction. American Psychologist. 52(11), 1198-1208. Hair, Jr. J. F., Anderson, R. E. et.al. (1998). Multivariate data analysis. New Jersey: Prentice-Hall. Hand, D., Mannila H. et.al. (2001). Principles of data mining, USA: Massachusetts Instittute of Technology. Huang, X. and Feng, S. (2015). Research on the teaching quality evaluation for the physical education in colleges based on the AHPTOPSIS. Chemical Engineering Transactions. 46, 487-492. Imtiyaz, M. and Singhal, A. (2015). Evaluating the quality of teaching in higher education institutes using clustering approach and set pair analysis. 1st International Conference on Next Generation Computing Technologies (NGCT) Proceedings. University of Petroleum and Energy Studies, 4-5 September 2015, India. p. 588-592. Kumar, S.P. and Ramaswami, K.S. (2011). Efficient quality assessment technique with integrated cluster validation and decision trees. International Journal of Computer Applications. 21(9), 30-36. Lupo, T. (2013). A fuzzy servqual based method for reliable measurements of education quality in Italian higher education area. Expert Systems with Applications. 40, 7096-7110. MacQueen, J.B. (1967). Some methods for classification and analysis of multivariate observations. Proceedings of the 5th Berkeley Symposium on Mathemaical Statististics and Probability Volume 1. University of California Press, June 21-July 18 1965 and December 27-January 7, 1966, California, p. 281-297. Mardia, K.V. (1970). Measures of multivariate skewness and kurtosis with applications. Biometrika. 57, 519-530. Pamuk, M. (2005). Öğrencilerin öğretim üyesini değerlendirmesine ait bir uygulama. Ekonometri ve İstatistik. 1, 41-49. Rousseeuw, P.J. (1987). Silhouettes: a graphical aid to the interpretation and validation of cluster analysis. Journal of Computational and Applied Mathematics. 20, 53-65. Tatlıdil, H. (2002). Uygulamalı çok değişkenli istatistiksel analiz. Ankara: Akademi Matbaası. Ünal, Y., Ekim, U. vd. (2011). Üniversite öğrencilerin ortak zorunlu derslerdeki başarılarının k-means algoritması ile incelenmesi. e-Journal of New World Sciences Academy Engineering Sciences. 6(1), 342-347. Venkatesan, S. and Fragomeni, S. (2008). Evaluating learning outcomes in PBL using fuzzy logic techniques. Proceedings of the 2008 AAEE Conference. 9-12 July 2008, Yeppoon, p. 1-7. Wang, M. H., Lee, C. S. et.al. (2013). Applying fml-based fuzzy ontology to university assessment. On the Power of Fuzzy Markup Language içinde (s. 133-147). Berlin Heidelberg: Springer. Xian, S., Xia, H. et.al. (2016). Principal component clustering approach to teaching quality discriminant analysis, Journal Cogent Education. 3(1), 1-11. Yıldırım, F., Bayrak, Ö.T., 2008, Ders değerlendirme verilerinin istatistiksel analizi. 1. Mühendislik ve Teknoloji Sempozyumu Bildirileri. Çankaya Üniversitesi, 24-25 Nisan 2008, Ankara, s. 248-256.